Carter, April and the “past” Turtles are being attacked by monsters towering fifty feet over them. The heroes finally escape and get the weakened “present” Turtles back to the lair. April heads off to warn the authorities of Dregg’s attack plan. Meanwhile Krang and Shredder free themselves from the rubble of the caved-in building and head back to the nuclear power plant. Back at the Turtles’ lair, the weakened Turtles are revived. The “past” Turtles want to get home. Carter sends out a message to Landor and Merrick to take the Turtles back to the past but he gets no response. Donatello reminds them that the “past” Turtles can only remain for a short while or all eight Turtles will cease to exist! Krang and Shredder are heading to the power plant when they run into a patrol of bat-men. Krang hypnotizes one of them and they continue to the power plant. Dregg reveals that he needs most of his bat-men to man his Attack Monsters. He also has his micro-bots construct weapons for the Monsters and sets them out to attack the Earth. Back at the lair, Landor and Merrick materialize only to find that the “past” Turtles went to battle the Attack Monsters. They go off to find them. 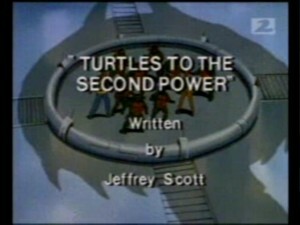 Carter and the “present” Turtles arrive at the power plant and battle Dregg and the remaining bat-men. During the battle, Dregg goes after Shredder, hoping to get the chip back. Donatello is knocked into the computer and he quickly does some rewiring. Dregg traps Shredder, Krang, Carter and the Turtles and gets the chip! He puts in into the transporter and orders Mung to transport a sunspot to the nation’s capital. Mung throws the switch and on the screen you can see the capital burn. Dregg watches as more sunspots are being transported to cities around the world. In the City the “past” Leonardo discovers that there are bat-men inside the Attack Monsters. The Turtles are able to get inside one and use it to take out all the other Attack Monsters. They head for the power plant in their Attack Monster. Dregg calls the UN demanding they surrender the world to him or he will turn the entire planet into a boiling sun. The UN official does not know what on Earth Dregg is talking about. Dregg is enraged. He checks his computer and discovers he’s got a bogus chip. Donatello reveals that he rewired the computer to play Dregg’s VR simulation of the sunspots. Dregg is furious. He aims his wrist blaster and is about to start shooting when the “past” Turtles arrive in the Attack Monster. The other Turtles finally capture Dregg and drain him of his Krang/Turtle energy. They transport Shredder and Krang back to Dimension X, and transport Dregg and Mung back to their home planet. Landor and Merrick arrive and take the “past” Turtles back to their own time.